The Cardium formation is a sandstone deposit encased in thick shale and the main producing interval of a number of different oil fields, including Garrington, Brazeau, Willesden Green and Pembina. 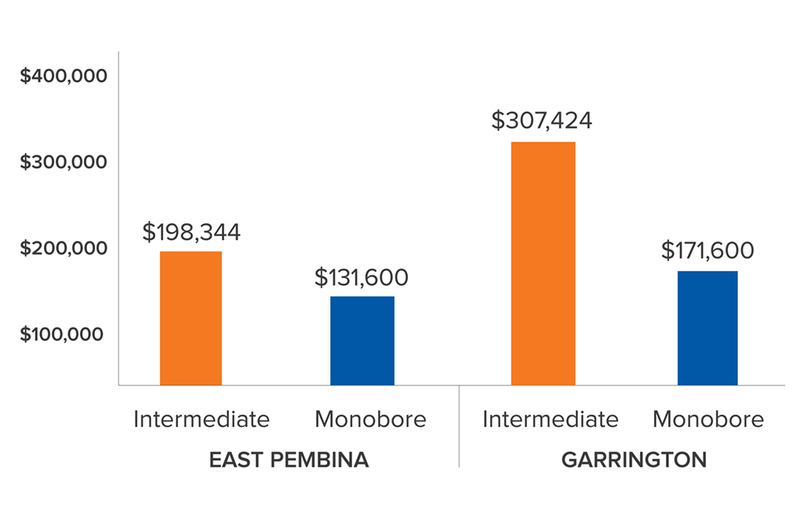 Pembina is the largest conventional oil field in Canada and is estimated to contain 9.3 billion barrels of original oil in place. As the sandstone deposits have largely been exhausted, exploration in the Cardium formation has evolved to focus on oil reserves within the unconventional areas of the formation, where a small percentage of the light gravity crude oil has ever been produced. Accessing these reservoirs was made possible by advances in horizontal drilling and hydraulic fracturing. This has made the Cardium one of Canada’s most active light oil plays. Operators in the formation primarily use open hole multi-stage (OHMS) completion systems, allowing access for multiple fracture initiation points and a more complex fracture network, which is linked to increased production. Completion methods in the Cardium have evolved from a traditional construction method that includes intermediate casing to a cementedback monobore design. Monobore well construction for OHMS horizontal wells is designed to provide operators with the advantages of open hole multi-stage completions, while reducing costs by decreasing drilling time and eliminating the intermediate casing. In monobore well construction, an open hole wellbore is drilled from the surface casing to TD before cementing back the vertical and build sections of the well from the heel with a stage tool. A stage tool is required to cement from the heel of the well back to surface in monobore ball-drop completion systems. The conventional stage tool is closed using a wiper plug or dart after the cement program is completed. The wiper plug or dart must be drilled out to ensure the open hole system is free from debris prior to stimulation. Debris pumped down the hole during stimulation can cause issues during completion operations. A drill-out to remove all debris from an open hole system with a conventional stage tool installed is performed due to the amount of debris generated from the stage tool and wiper plug. Several cleanout trips may be are required to ensure a clear wellbore. This is a costly and time consuming process. An operator with experience running conventional stage tools in the Cardium was continually investigating ways to reduce costs and increase operational efficiency in their monobore wells. Packers Plus offered a solution by providing the operator with a StackFRAC (SF) Cementor™ stage collar that closed mechanically, which eliminates the drill-out altogether. By implementing the new stage collar the operator further reduced costs and increased efficiency in their monobore wells. This stage collar is hydraulically activated and can close without the use of a wiper plug or dart. Once cementing is complete, the SF Cementor is mechanically closed by applying compression. This design reduces post-cement cleanout operations, significantly reducing the likelihood of issues associated with debris in the system and lowering costs. In case of incomplete or premature closure, this stage collar is designed with redundancy features to ensure the tool works to its full capacity, including a secondary closure sleeve that maintains full inside diameter and the ability to reopen the tool during cementing operations. To manage the operational risk of implementing a new well construction technique, the operator drilled its initial monobore wells with a vertical and build section of 222 mm, and an open hole diameter of 159 mm. This would allow the operator to install and cement intermediate casing if wellbore stability became an issue. As the operator became accustomed to procedures for drilling monobore wells, the vertical and build section was condensed to 171 mm to further reduce costs. The diameter of the open hole horizontal remained at 159 mm. The operator determined that these are the optimum wellbore sizes for monobore well construction. The operator has completed more than 220 wells in the Cardium using the SF Cementor stage collar with 100% success. 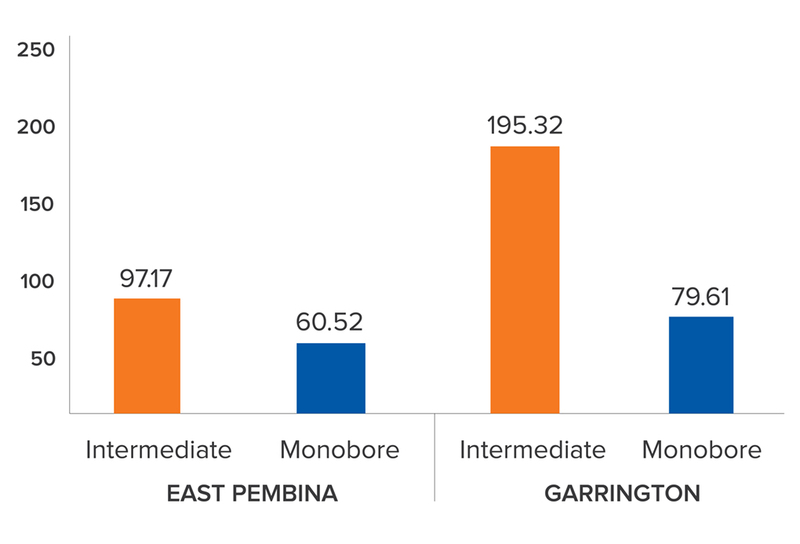 By adopting monobore well construction in the East Pembina and Garrington fields of the Cardium formation, the operator reduced drilling and operation hours by 38% and 59%, respectively, over previous operations using intermediate casing. Once the operator implemented the SF Cementor stage collar, the average number of drill-out days prior to stimulation was reduced, providing additional cost savings. The average number of days to perform a drill-out for 20 wells with the conventional stage tool was 4.3 days and for 20 wells with the new stage collar was 3.1 days. The SF Cementor stage collar is a field-proven technology solution driving efficiencies in cemented-back monobore completions and reducing well construction costs. This stage collar has been run in conjunction with open hole multi-stage completion systems in a variety of formations around the world.